Jack O'Connor's loud objections to long-range hunting were not muzzleloading-specific, for Mr. O'Connor was objecting to the entire category that gave the impression of living game animals being no more important than gongs, stationary pieces of a paper, balloons, something you try to hit to win a belt buckle, or just want to boorishly brag about. It starts with external ballistics as shown by the .45-70 Government 405 grain bullet at 1305-1330 fps, one of the most prolific hunting loads of all time. This load, still a factory load, is a 405 grain .281 G1 BC projectile at 1330 fps. It has a Maximum Point Blank Range, 6 inch kill zone, of 135 yards. To obtain this, sight-in range is 114 yards. It is quite lethal past 500 yards, but precise shot placement is virtually impossible under hunting conditions . . . at 500 yards. To comport to the Jack O'Connor avoidance of hold-over, it is a 135 yard load on whitetail. While the ballistic profile of this load is dramatically improved from the round ball, it remains a very short range load. The .451 Whitworth style 480 grain bullet, 1325 fps, .300 BC has the same 135 yard range, a wonderfully terminally effective load for most all game, as shown by Doc White. If you are an ethical hunter in the style of Jack O'Connor, your job is to get within 135 yards of your animal. But, we can improve the Maximum Point Black Range substantially, and have. A listing is found here: http://randywakeman.com/MuzzleloaderDifferencesinPointBlankRange.htm . No longer is 135 yards the maximum O'Connor ethical distance, it is now 200  233 yards without much drama. 250 yards is now a reality, using the top of the shoulder limit Jack O'Connor suggested. While this not make the headlines, 250 yards is a significant improvement over the classic .45-70 cartridges: about an 85 yard increase in ethical range, over 62% more Maximum Point Blank Range distance. The basic ballistic profile for a Parker 300 grain Match Hunter follows, at 2100 fps, to 300 yards. While 50 fps at the muzzle, either way, is trivial, my standard load for the last decade has been a 300 grain saboted projectile at 2300 fps, which does make a difference. Jack O' Connor was right, of course, that the tortured estimation of paces showed that most hunters had no ability to estimate range accurately, or even measure it. Yet, personal laser rangefinders were not in use, and accurate range is a problem largely solved. If you are in a situation where shooting at steep inclines is a possibility, true ballistic range laser rangefinders are increasingly common. The most sophisticated, the G7 BR2 by Gunwerks, takes into account temperature and barometric pressure for you as well as incline. The reason load work-up to start with is at 100 yards, not 200 yards, not 300 yards is resolution of the data. It is loads that are being tested, not wind, nor the shooter. This is why the more reliable accuracy testing is done in a 100 yard test tunnel, so wind is not a factor, and the rifles are fired from machine rests or fixtures. This removes the two worst factors from contaminating the data: the human factor and the wind. Both are unpredictable. Naturally, after your 100 yard load work up the load you have selected is shot at all the ranges you intend to hunt at. 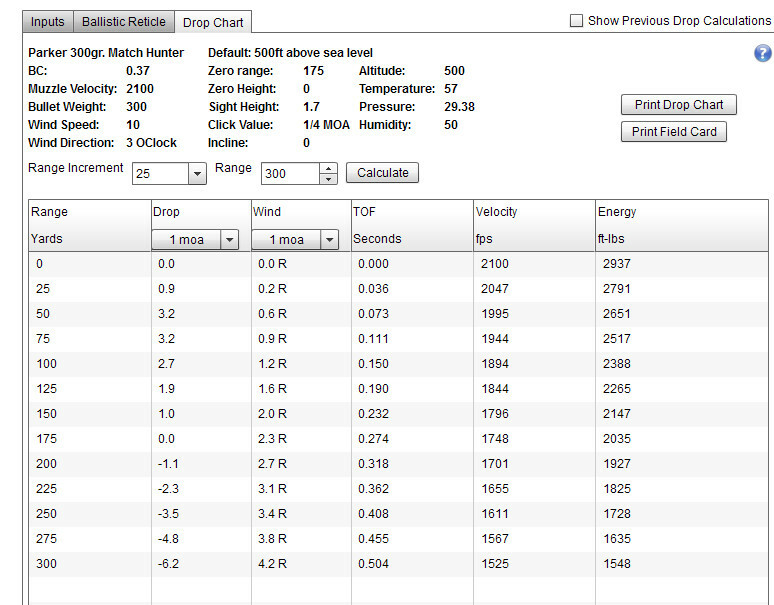 Not to confirm accuracy as much to confirm vertical trajectory under your own ambient conditions. That's an open question. As a friend of mine likes to put it, you'd have to be the world's worst whitetail hunter or in the worst whitetail hunting area in North America not to be able to get within 200  250 yards of your game. Indeed, most whitetail are taken inside 100 yards with all firearms, the average shot being 86 yards. In many areas, you can't see a deer in the woods at 100 yards, much less greater distances. Any deer 100 yards in, in a thickly wooded area is pretty safe, for the magic bullet that will snake its way around 200 oak trees, the mythical meat-seeking missile, hasn't been invented yet. If that is the type of area you're hunting, the answer is of course not. While long range hunting half and hour after sunset makes little sense, and there isn't much difference between a button buck and a doe at 200 yards after sunset, it isn't the same type of hunting everywhere. Daylight hunting and longer ranges are common for pronghorn and of course elk and moose have far larger kill zones than whitetail, so 300 yards and beyond requires less exact shot placement commensurate with the larger kill zones. Although muzzleloaders can be loaded to .458 WinMag levels, the .458 WinMag is a short-range cartridge, and not a rational choice for deer hunting. However, coming from a different perspective, the .458 SOCOM makes more sense: a 35,000 MAP cartridge that produces 2150 fps with a 250 grain bullet, 1900 fps with a 300 grain bullet, and 1860 fps with a 325 grain bullets. Muzzleloaders have bettered the .458 SOCOM performance arena for many years, without unacceptable recoil levels or excessive noise levels that may cause permanent hearing damage with a single shot. If you're smart, which all of my readers naturally are, you know a 300 yard muzzleloader doesn't exist in terms of Maximum Point Blank Range. A .270 Winchester is a 309 yard MPBR rifle, though. Common sense tells us that isn't happening from a muzzleloader unless we are shooting a .277 inch diameter bullet at the same velocity as a .270 Winchester, and no muzzleloader does that. Nevertheless, 300 yards is not a problem under ideal conditions. The point is largely Boy Scout's Motto. A savvy hunter, prepared for 300 yard shots under ideal conditions, knows that hunting is never under absolutely ideal conditions. Animals are not stationary, hunting isn't done in a test tunnel, ambient light is rarely laboratory perfect, animals don't always pose 100% broadside at known distances, we aren't surrounded by wind socks, and we don't drag lead sleds or mechanical rests into tree stands. The point of 300 yard practice isn't just beer-foam filled obnoxious bragging, or encouragement of slob-hunting. If you are proficient at 275  300 yards on paper, you'll be better prepared on a hunt where 190, 215, 230, 250, or 260 yards is a responsible, ethical shot opportunity. Anybody with partial use of a brain can get a bullet of a muzzle faster. The problem is, deer don't care how fast you miss them, and the fastest thing out of a muzzle isn't the most accurate. Neither recoil, eardrum-splitting muzzle blast, or abuse of equipment or your shoulder promotes accuracy. Nevertheless, a 300 grain Parker Match Hunter at 2300 fps has a 6 inch kill Maximum Point Blank Range of 228 yards. At 2100 fps, it is 208 yards. Though not what intoxicated advertising departments want to here, those are loads that would make Jack O'Connor smile. They are still quite dramatic, impressive loads as compared to the 135 yards of the classic .45-70-405 load. The notion of hunting accuracy is a sloppy term. In a fairly silly way to look at hunting accuracy, David Petzal and some friends conducted a test of sorts with .308 Weatherbys, shooting at 100 yards and 200 yards in April, 2014. The idea was to compare hunting accuracy of lightweight vs. heavier rifles. The results should give everyone a bit of pause: the lightweight rifle average group size was 8.26 inches. The standard weight rifle group average size was 6.69 inches. Neither of those .308 bolt-action centerfires are 300 yard guns under those concocted hunting conditions. It makes you wonder, or at least it darn well should. The Everything Out to 200 Yards is Toast was the nebulous ad-brag of Thompson-Center several years ago, referring to the Encore. There was an debate soon thereafter, whether the 'making toast' ads should be increased to 250 yards or even 300 yards, because they managed to kill a couple of hogs in Texas at 300 yards. Naturally, they didn't bother to count the hogs that were gut-shot and lost, or just flat-out missed. The Encore ad-brag stayed at 200 yards. One thousandth of an inch at the muzzle equates to about one inch at 100 yards. Holdover reticles aren't quite the gimmicky disaster that Jack O'Connor thought they were, but they can be. They aren't accurate, unless you do your own homework and work up your own personal ballistic profile. The 1/4 inch a.k.a. 1/4 MOA clicks in many scopes aren't perfectly accurate, either. Whether they are accurate enough for you, though, is something only you can answer by doing the field shooting in your own rifle. In order to make longer ranges manageable, you need both good velocities and good ballistic coefficients. One without the other is like Laurel without Hardy. Two examples come to mind, both excellent loads within their limits. The new Federal 270 grain Trophy Copper hits about 2200 fps with 120 grains by volume of Blackhorn 209. It is a beautiful load for the vasy majority of whitetail hunting, but not for 300 yards. At 300 yards, the 10 mph wind drift is 30.79 inches. A Parker Match Hunter 300 grain at the same 2200 fps velocity, at 300 yards, has a 10 mph wind drift of 12.03 inches.